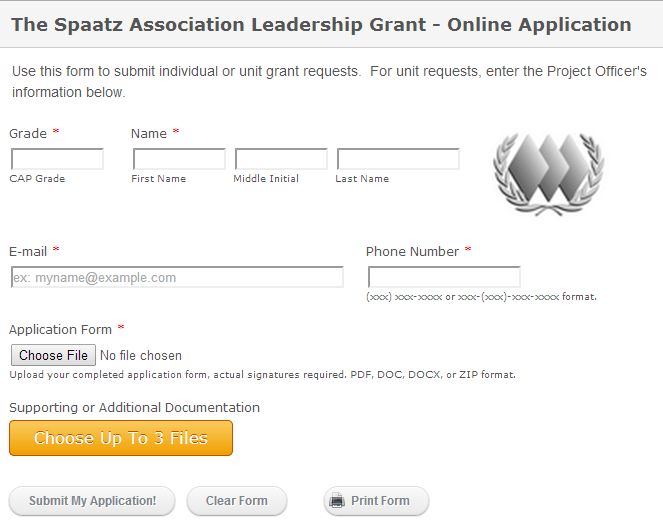 Time is running out to get your 3rd quarter Leadership Grant applications in. Applications are due by 1600 Eastern Time on 31 July 2014 to qualify for grading. Grant applications not awarded in the 1st or 2nd quarters will remain on file and be reconsidered for a maximum of one year, or until the funding date (the date funds are needed by the member) has passed, whichever is earlier. Each year, the Association will approve up to $20,000 in leadership grants to individuals or units at the squadron, group, or wing level. Grant requests may be of any amount, so long as they are used directly for programs and activities associated with cadet leadership development. Designed for units at the squadron, group, or wing level that need funding to conduct CADET leadership development-related activities. 1) Download an application form below (see Where Can I Get More Information? ).